Is this flippin’ worth it? In this post I want to look back at a series of activities I used with my beginners class last year with a couple of questions in mind. First some back story: this post has been languishing half-written in my drafts (and in the back of my mind) for months, never getting written, mainly I think because I’m not actually convinced it’s worth it. 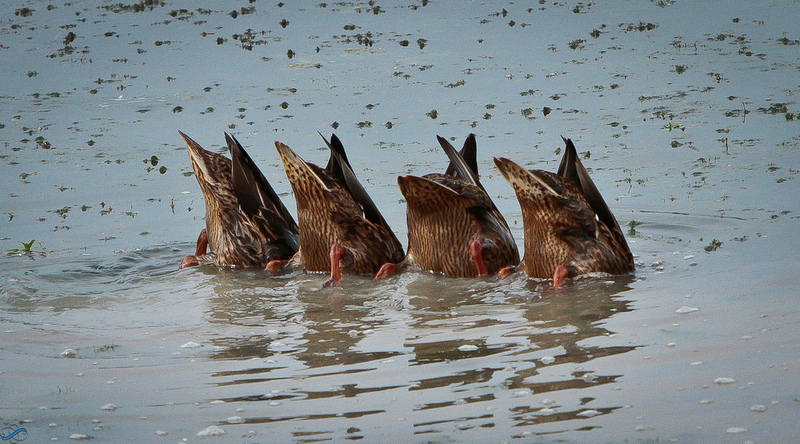 But last week I joined in with the weekly twitter #eltchat discussion and the topic was flipping the classroom, or more specifically, the best use of classroom time in a flipped classroom, and these thoughts floated back to the surface (a little like the ducks in the photo will inevitably do sooner or later). Back to my class. As a routine, after each lesson, I would send an email to the class, sharing a summary of the lesson, links to any videos we might have shared in class so they could watch them again and suggesting some possible follow-up tasks. These could be consolidation tasks, maybe writing a short text or dialogue putting the key language into context, or sometimes a link to a new video clip to watch for the next class. I guess this is where the flipping comes in. Let’s take a slight sidestep to reframe the first question: what is flipping? And here is a link to an infographic from Knewton. These were the two first sites that came up when I did a google search. The first is, as expected, quite wide open, the second (equally predictably) is pretty prescriptive. Both focus on the content classroom, a classroom that is seen as being very traditional, mainly based on teachers lecturing or presenting information in class, and students applying this information at home in homework tasks or in tests. It’s an interesting movement, with its pros and cons, its evangelists and its detractors, but I’d argue it isn’t actually directly applicable to a communicative language class. So, what does flipping look like in an ELT classroom? Back to my class. Here are a couple of very simple “flipped” activities I tried with my students, I don’t know if they might answer the question in part. I don’t like coffee in the evening. I don’t have coffee after 11 o’clock. I can’t sleep if I drink coffee in the evening. We looked briefly at the phrase “11 o’clock” but we didn’t have time to go into time (sorry!) in detail so, as a homework task, I asked them all to look at this very simple video presentation. (I’m sorry, embedding is disabled for this video) In the next class I showed the video on mute and asked the class to explain what they’d learned using the images to prompt them. We paused and replayed where necessary, the students discussed and prompted and took it in turns. They’d all watched the video at home and they could all tell the time using the clocks in the slideshow. It took about five minutes of classroom time. We went on to weave times into the rest of the lesson adding on useful questions (What’s the time? What time is it? Do you have the time?) into situational conversations built up by the students. So, was this flipping? I guess so, but only a very small section of the class. Was it worth it? I think it saved time. I think it boosted the students’ confidence in their ability to understand the video (listening comprehension was a huge hurdle for them), it boosted their confidence as independent learners and in their ability to display their learning. Each student had had time to process the information and the language in their own time, watching as many times as they wanted/needed to, pausing, replaying, generally taking control, and I think this brought added value. And the lesson got off to quite a hardworking, focused start. Prior to the coffee lesson above, we hadn’t really talked about likes or dislikes and we hadn’t looked at the use of the verb to like. I knew that most of the students would probably be OK with it, but I also guessed that there was one student in particular who might “problematise” it if we looked too closely at the structure in class. The verb like works differently from its Spanish counterpart, gustar. In English the liker is the subject and the liked is the object : I like you, but in Spanish the liker is the object and the subject is the liked : me gustas . This is the same in Italian with the verb piacere. In my first few months in Italy I found this verb really difficult to unpack. Tu me piace made sense to me as You like me when actually it meant I like you. Or the opposite, Yo te piacio? which means Do you like me? I processed as I like you. This lead to embarrasing silences and awkward pauses in the first encounters with my Italian boyfriend at the time! So in order to side step this confusion and any possible contagion, I set the students a clip from the Hungry for English series on youtube on the verb like. There’s no overt teaching of the form, just a simple paradigm table at the end. The delivery may be stilted, but it’s very clear, as are the concepts. In the lesson we didn’t watch the video, we mentioned it in passing (they liked this particular series of youtube lessons) but mainly we just talked about meals and food and restaurants etc we do and don’t like. The one student I’d been worried about had very few problems. I needed to prompt her on the structures with like a couple of times, but on the whole she was just fine. Once she said, oh, yes, like the video! So, that’s it. There are more examples of the same thing, but I won’t bore you with them! As to the two questions, I don’t really know if it’s flipping, but I guess I’ll keep experimenting with it, ‘cos on the whole, yes, it does seem to be worth it. This entry was posted in #eltchat, lesson ideas, reflecting on teaching, thoughts on teaching and tagged #flipped classroom #boosting confidence #listening #beyond the classroom. Bookmark the permalink. 9 Responses to Is this flippin’ worth it? I agree – flipping is just part of what we do as we add variety and cast around for the most effective way to get our job done, and I guess tech facilitates the “out of class” dimension and makes it much easier to guide students to explore and extend beyond the classroom. Interesting blog post. As I got to the end of my teaching days I found more and more that it worked better for me to have students prepare outside of class and to use class time to focus on speaking. For motivated students this worked very well, because speaking fluency was always the area that they struggled the most with (desire to be perfect usually held them back). For the less motivated students it occasionally backfired since they firmly held the belief of classroom time is the only time they should spend on language learning. Situations like that actually pushed me to find better ways to get them to speak. Students wanted to speak, but often got shy when having to speak about themselves all the time. I put together a lot of ESL “fluency videos” about easy to understand topics (e.g., Starbucks and space robots). After they watched it, and I gave them a some time to learn new words, we could easily chat together about something tangible and interesting. Maybe they could be beneficial to you and your community of readers too? It’s completely free (put together a website for fun/to help others). This is an interesting post, thanks. I have just started the DipTESOL (OxfordTEFL)and have been experimenting with the flipped approach this year with my students. I have them prepare before the class – using the school VLE (Moodle) and we then spend the lesson using and exploring the language in more interesting ways. The biggest problem I have at the moment is getting everyone to ‘buy in’ to the idea. I would be interested to know how you have approached this. Hi Tamara, thanks for dropping by! I guess the “buy in” factor is the trickiest thing about implementing a flipped approach. One way is to use very short video clips, max two minutes, initially, so that students can see that you’re not requiring too much of them. Or other short, easy tasks that don’t involve too much of a time commitment on their part. Then it’s important to follow up with engaging, dynamic tasks in class which exploit the flipped materials and those students who didn’t prepare will feel a little left out. And also, just to keep going, experimenting and pushing and explaining to the students what you’re doing and why. Hope that helps!